Today, relatively few Americans grasp the seriousness of polio, measles and tetanus, thanks to the success of routine immunization. But those whose lives have been touched by these diseases can never forget how damaging they can be — and how important it is to keep vaccinating. It was 59 years ago when measles crash-landed into Emmi Herman's childhood, putting her 9-year-old sister into a coma and destroying her chances at a full life. Her sister's measles turned into measles encephalitis, or swelling of the brain, a complication that occurs in roughly one in 1,000 cases. It left her with a permanent brain injury and long-term physical and emotional difficulties. "My sister is childlike in many ways and cannot live independently," Herman, a children's book author from Searingtown, N.Y., said in a recent interview. "I often wonder what our lives would have been like had she been able to get the vaccine." 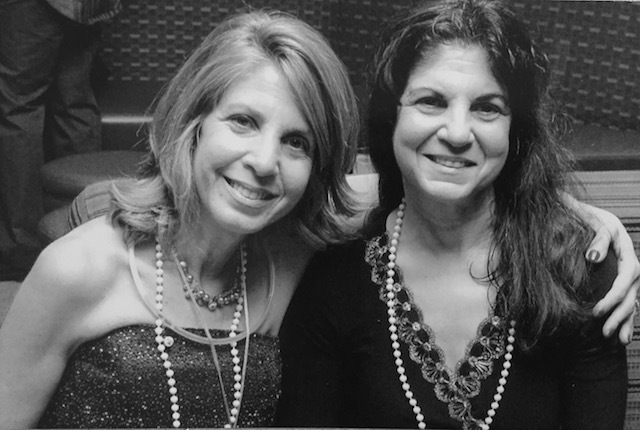 "My sister got sick before there was a vaccine," says Emmi Herman (left). "Now that there is one, no child or family should have to endure the lifelong hardships that we have." Today, most of America has largely forgotten just how serious measles can be — that it's more than spots on the face, and can cause permanent hearing loss and even death from pneumonia. That's thanks to routine immunization. Before the measles vaccine was introduced in 1963, nearly all children got measles by the time they were 15; in the U.S. tens of thousands were hospitalized and about 400 died every year. Today, most doctors have never seen a single case. Herman can't forget what measles did to her family. She decided to share her story and become a vaccine advocate after reading about a 2014 measles outbreak in California. "I learned that the reason it spread so fast was that immunization levels in the area had dropped, because parents were opting out," she recalled. "I thought I might be able to get through to those who are on the fence about vaccinating their children, and help convince them how important it is. My sister got sick before there was a vaccine. Now that there is one, no child or family should have to endure the lifelong hardships that we have." Polio, part of every parent's nightmare more than a half century ago, has been similarly vanquished stateside; the last indigenous case in the U.S. was in 1979. But polio is not a distant memory for Minda Dentler. Born in India 39 years ago, before polio immunizations were widely available there, Dentler contracted the disease as an infant and her legs became permanently paralyzed. Adopted from an orphanage by an American family and raised in Spokane, Wash., she remembers having to sit out while her siblings played sports. 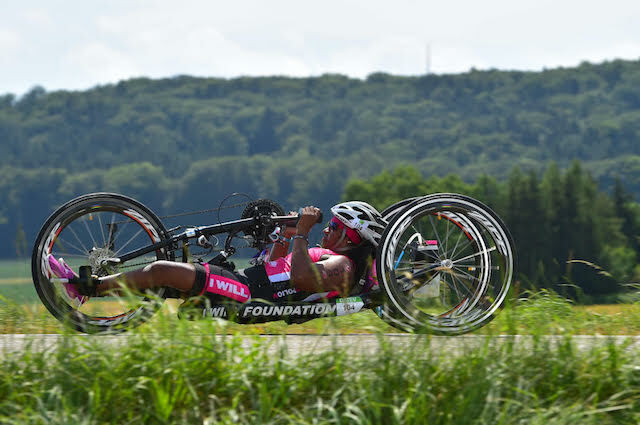 Minda Dentler, 39, who was paralyzed by polio when she was a baby, competing in Challenge Roth in Roth, Germany in 2015. Her role as Rotary ambassador and vaccine advocate are simple: "I can't change what happened to me, but I can help make sure other children are spared." Dentler didn't sit out for long. As a young adult, she began training and in 2013 became the first and only female wheelchair athlete to complete the Ironman championship course. She also works full-time in the financial services industry, is married and has a 2-year-old child. "The day my daughter got her first polio vaccine, it hit me how completely different her life will be from mine," Denter said in a recent interview. "Watching her running, hopping, kicking — doing all the things I can't do — only reinforces for me the need to keep vaccinating, to keep going until polio is gone for good." The day my daughter got her first polio vaccine, it hit me how completely different her life will be from mine. Teaming up with the local health workers in poor communities near Kolkata and Delhi, and administering polio drops to some of the children, "felt like I was coming full circle," Denter said. "I can't change what happened to me, but I can help make sure other children are spared. No one should have to live with the effects of polio when it's completely vaccine preventable." In India, Denter says she was struck by the fact that many parents had to walk for miles and wait hours to get their kids vaccinated, while in the U.S., "my generation seems to take vaccine access for granted." Neonatal tetanus is another disease that has been effectively wiped out in the U.S., with only seven cases reported since 1980. Most people think of a tetanus shot as something you need when you step on a rusty nail, not a critical step in prenatal care. Caused by unsanitary conditions during childbirth, tetanus is almost always fatal in newborns and still kills approximately 93 babies every day. Carrie Rhodes will never forget how her daughter nearly died from it. Rhodes was working at a children's hospital in China in 1997 when she met her, a 2-month-old baby girl who had had tetanus but was treated and, against all odds, survived. The nurses told her that the baby's parents had brought her in, but had left when she was still convulsing, probably believing she would not make it. "When I think of the nightmare those poor parents endured, how helpless they must have felt...I ache," Rhodes wrote in a moving account of how she came to adopt the baby, name her Dani, and bring her home to Seattle, where she grew up healthy and strong. Today, Dani is a thriving college student in Boston studying fashion merchandising. 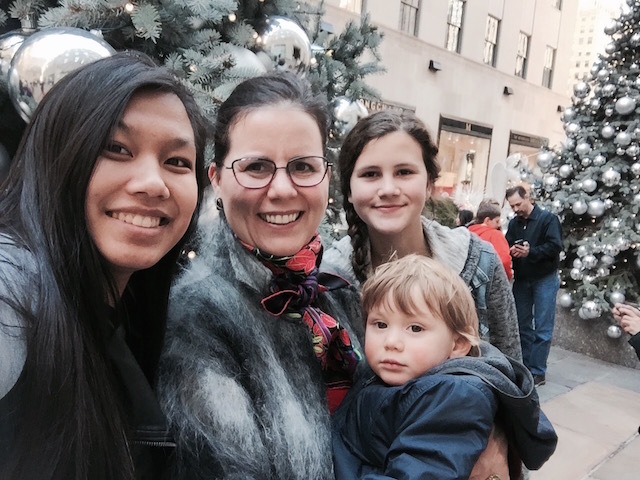 "It's gratifying to see that we're that much closer [to eliminating tetanus] and that fewer mothers and children will suffer," says Carrie Rhodes of Seattle, pictured here with her daughter Dani (far left), who was born in China and miraculously survived tetanus as a baby; sister Lily, 14, and Eli, 3. And Rhodes is now a vocal supporter of Kiwanis International and The Eliminate Project, a partnership with UNICEF to end maternal and neonatal tetanus (MNT) worldwide (she is also a UNICEF USA Northwest regional board member). Thanks to global immunization efforts targeting women of reproductive age – just three doses of an inexpensive vaccine protects the mother and her future babies for the majority of her childbearing years – the number of newborn deaths from tetanus are down by 40% annually since fundraising for the partnership began in 2011, and the disease has been eliminated in 21 countries. "I get excited when I hear that another country has eliminated MNT," Rhodes said in a recent interview. "It's gratifying to see that we're that much closer and that fewer mothers and children will suffer. I am surprised when people here in the U.S. don't vaccinate their children when they have the option to, and that we're seeing things like the recent mumps outbreak in Seattle. I can't believe that we even need to say it — that vaccines are important and save lives." UNICEF works with partners to bring immunization to children around the world, and to make sure that children everywhere, not just in the U.S., can benefit. These efforts have helped reduce child mortality by more than half since 1990, saving an estimated 2 million to 3 million lives every year. Not only that — every dollar spent vaccinating yields an estimated $44 in economic returns by ensuring children grow up healthy and able to reach their full potential. But unless everybody is vaccinated — without full immunization coverage — these gains can be quickly lost. Vaccines work. Help UNICEF protect children through immunization. As part of World Immunization Week 2018, UNICEF and partners are calling on everyone — from governments and advocates to donors and members of the general public — to do what they can to help increase immunization coverage in their communities. Because every dollar spent on all forms of childhood immunizations yields an estimated $44 in economic and social benefits. And because immunization provides a foundation for good health at the start of life, and puts children on a path toward a healthier, more productive future. Show your support: Add your name to our petition urging the U.S. Congress to maintain funding for programs needed to further reduce child mortality — including more access to lifesaving vaccines — via the bipartisan Reach Every Mother and Child Act. Top photo: Minda Dentler, Rotary Ambassador, administering the polio vaccine to a child during a national immunization campaign in India, 2015. Photo Credit: Rotary International.